You won't want to kick this lovely lady out of your bed. 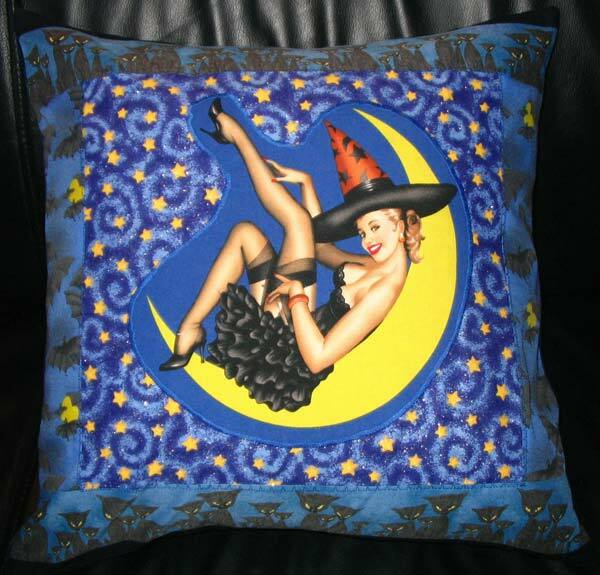 This pillow features a lovely witch on a moon with a celestial fabric background backed with blue velvet. Size: Aprox 18" x 18"
You won't want to kick this lovely lady out of your bed. 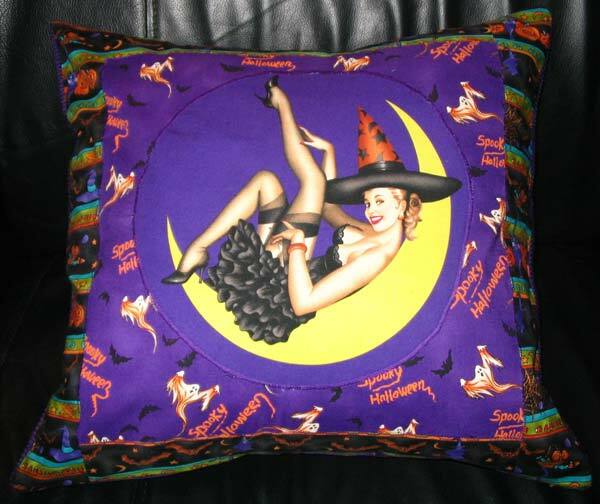 Our favourite witch is displayed on a purple background, surrounded by spooky ghosts and backed with purple cord fabric. 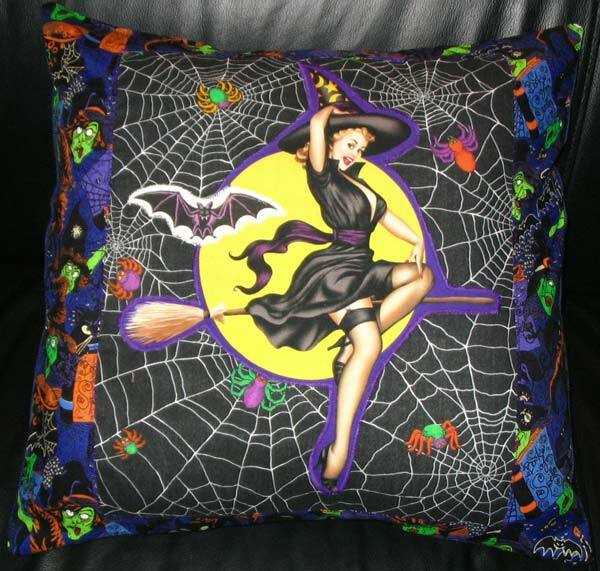 Size: Aprox: 18" x 18"
Flying through the night on her trusted broomstick, this witch pinup pillow has our lovely lady on a background of spiderwebs and backed with denim fabric. 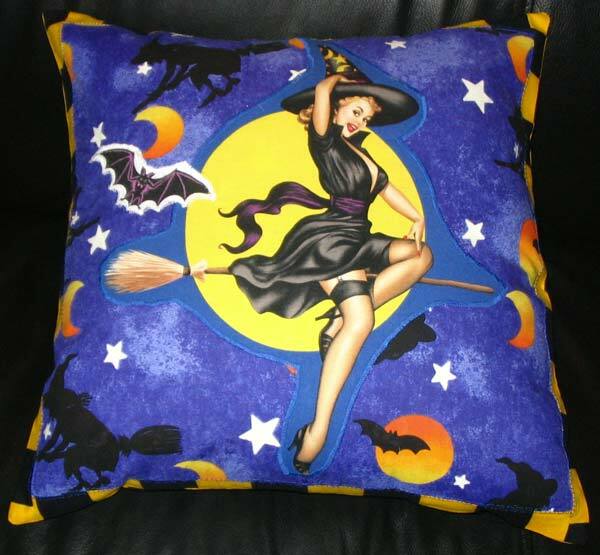 Size: Aprox 20" x 20"
Soaring through the night sky surrounded by bats and other witches, and backed with yellow and black striped fabric, this witch pinup girl won't be giving you any nightmares. Dressed in a she-devil costume, this pinup looks as fiery as her red hair. 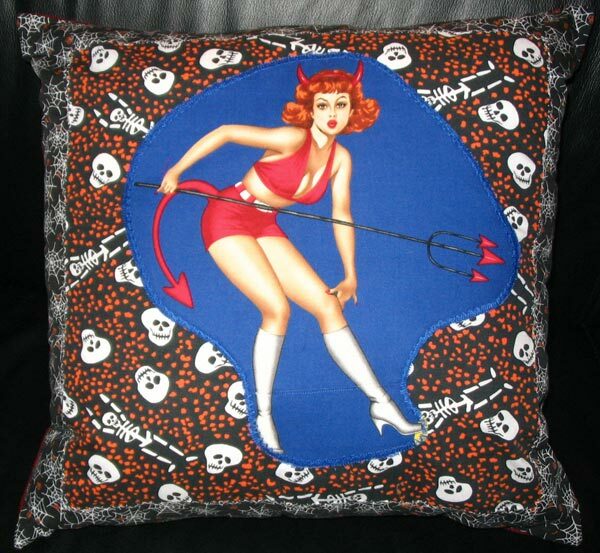 The pinup girl is placed on a skull fabric background and the pillow is backed with red upholstery fabric. Size: Aprox 18" by 18"
This redheaded pinup is dressed in a naughty she-devil costume. 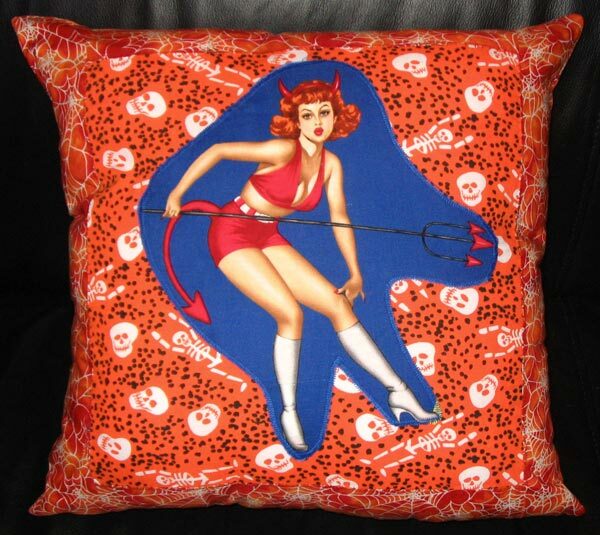 The pinup girl is placed on an orange skull fabric background and the pillow is backed with orange faux suede microfibre upholstery fabric. 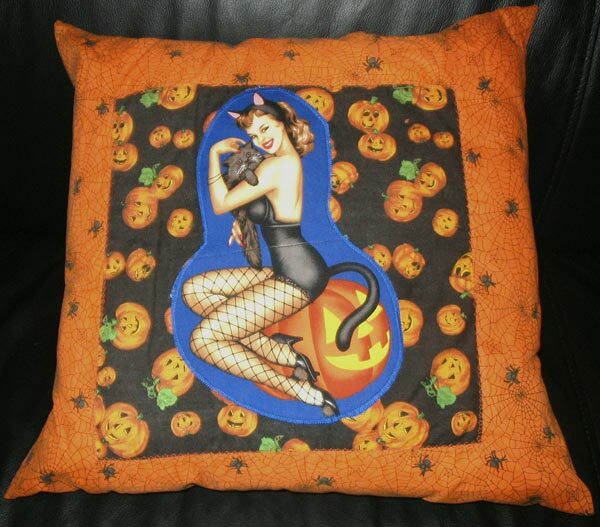 Dressed in a sassy black cat costume, this pinup really pops against the pumpkin background and the pillow is backed with dark navy upholstery fabric. Size: Aprox. 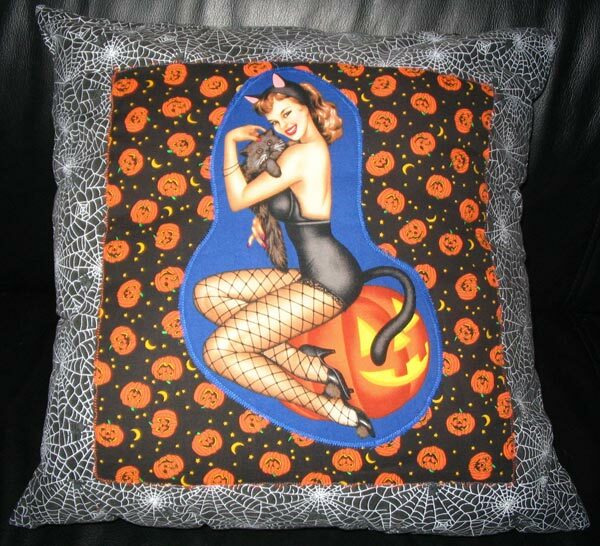 18" x 18"
This pinup dressed in a black cat costume works nicely with the dark blue pumpkin and cat themed fabric. The pillow is backed with orange faux suede microfibre upholstery fabric. This black cat pinup looks sweet enough to curl up with on the orange pumpkin background. This pillow is backed with orange faux suede microfibre upholstery fabric. Size: Approx. 18" x 18"